Wednesday, November 21, was the date of the last qualifier for the Half Bred Horse Breeders Society’s three year old loose jumping championship. This was held at Mossvale Equestrian Centre and was judged by Gareth Clingan. The Society is most grateful to Gareth for kindly giving up his time for this event. 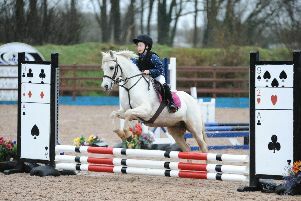 The final is due to be held at Connell Hill Equestrian Centre tonight (Wednesday, December 5) commencing at 7.30pm. The Half Bred Horse Breeders Society is a non-profit making voluntary society dedicated to representing the interests of sport horse breeders and promoting their stock. Breeders and buyers should not miss this opportunity to view potential stars of the future. Thanks also go to Tori O’Conner Photography for taking the excellent photographs on the evening. Also thanks to Drumhowen Stud for the presentation of the rug to the winning three year old. For further details contact Carole on 07887 389 606.